I discovered a forgotten package of turkey wings stranded in the back of the freezer that need cooking. I decided to roast them ahead for snacking and mid-week dinners. Perhaps it is some sort of atavistic throwback to my ape heritage, but I love gnawing on roasted chicken or turkey wings. 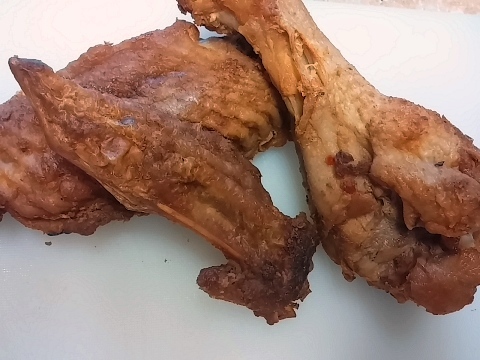 Divided into three parts, the turkey wing tip is great finger food and the middle section with plenty of white meat, makes a great serving portion. The largest piece is paramount to a huge leg; there is plenty of dark meat for sandwiches, tacos, and makes a convenient protein for a pasta dish. Turkey really benefits from a good soak in brine: it removes any impurities and tenderizes the meat. I let the wings partially defrost, submerged them in lightly seasoned brine, then socked them away in the refrigerator for an overnight stay in a zip lock bag. Occasionally I would flip them and give them a little massage to encourage even defrosting and brining. Later the next day I drained the wing pieces, patted them dry, rubbed them with a hearty paste of smoked paprika, garlic, lemon juice and olive oil—and popped them into the oven for a good roasting. It wasn’t long before the entire house was filled with mouthwatering aromas of smoked turkey. 1 tsp olive oil, approx. 1. Wash and cut up the turkey pieces. 2. For brining: In 2 cup container combine the salt in about 1 cup of hot water to dissolve; add the bay, garlic and red pepper flakes. Place the turkey pieces in a large zip lock bag or container, pour in the brine and enough water to barely cover the turkey. 3. Refrigerate overnight, turning occasionally to brine evenly. 4. Preheat oven to 350 degrees. Line a roasting pan with foil and spray or wipe with oil. Remove the turkey from brine, rinse lightly and pat dry. 5. Combine the smoked paprika, garlic, lemon juice, and salt with enough olive oil for a paste. Rub this evenly over all turkey surfaces. Place on baking pan and roast for about 2 hours, turning every 30 minutes, until the skin is well browned all over and crispy. Serves 2 to 4.